Password Shield is a security program that allows you to input a password into a field on a Web form or similar input box without actually knowing or seeing the password. Password Shield will only input the password into a masked input box, so even when the password has been input, the user does not see the password. This is useful for companies that need to give their employees access to certain secure systems but want to keep passwords secret. A typical example would be a company that needs to allow their employees to remotely access other companies' computers to do maintenance work, but does not want to give the employees the actual system passwords they have been entrusted with. Another example would be a company that needs to give its employees access to the company PayPal or online bank accounts, but does not want the employees to have the passwords, which they might then use to access the accounts from home. One very nice feature of Password Shield is that to send a password to an input field, an employee must first sign onto Password Shield with their own individual password. Once someone signs on, Password Shield keeps a log of all the passwords that person uses. If any suspicious activity occurs in the account, you can check the log to see who was signed on at that time. It even records unsuccessful attempts to put the password into an unmasked text box, where it could be viewed. Another nice feature of this program is that many spyware keyloggers cannot intercept the password that is sent from Password Shield to a program or Web site. This is because Password Shield sets the password directly into the text box, rather than sending keystrokes. Key logging is a common method of stealing passwords and other information. Although we cannot guarantee absolutely that spyware cannot steal your passwords, Password Shield does reduce the probability that any spyware on your computer will be able to obtain your passwords. 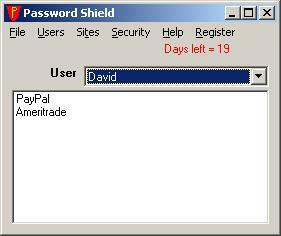 Password Shield is available as shareware ($25.00 individual fee, with volume discounts available). Try it for 30 days to see if you like it before you have to pay for it. Just download the install file to your computer, then run the file like a program by double-clicking on the install file in Windows Explorer or My Computer to install the program. Remember that complete instructions are provided for uninstalling the program if you decide that you do not like it. Click here to download the installation program (pwsarc.exe). send email to Leithauser@aol.com or call (386)-410-6769 and describe the addition features you would like to see in this program. If they sound like good ideas, we will add the improvements at no charge. To pay for this program online, click here.